Since 1986, Harvey S. Mars has provided quality legal representation to employees, labor organizations and employers in diverse legal matters ranging from employee benefits law, covenants not to compete and employee confidentiality agreements, collective bargaining negotiations, arbitration, employment discrimination litigation, ERISA litigation and administrative proceedings before the National Labor Relations Board, New York State Employment Relations Board, U.S. Equal Opportunity Commission and The New York State Division of Human Rights. He is a diligent and tenacious advocate who particularly enjoys providing legal representation and advice to professional musicians and recording artists. Currently, Harvey serves as In House counsel to the Associated Musicians of Greater New York, Local 802, AFM, the largest local union representing musicians in the United States. He is also Co-General counsel to District Council 1707, AFSCME, a union representing 25,000 social service employees employed in day care, head start, home care, direct care services and various other non-profit industries. He also is counsel to the Union of Adjunct Faculty at Pace, which is comprised of over 800 adjunct faculty members employed by Pace University as well as the Northern New Jersey Musicians Guild, Local 16-248, AFM. In addition to Union clients Harvey also represents the Local 389 DC 1707 Home Care Employees Pension Trust Fund and is collection counsel to the Local 802 Musicians Health Benefit Fund. Harvey has also provided legal services for the International Longshoreman’s Association and related employee benefit trust funds, IBT Local 102 (Anheuser Busch Newark Brewery employees), Mason Tenders District Counsel Benefit Funds, TWU Local 562 (Airline Mechanics), Local 638 of the United Association of Steamfitters and Plumbers, The Doctors Council and IATSE Local 764 (Wardrobe employees). Harvey also provides legal services to the United Block Association, a non-profit organization the runs four senior centers in Harlem New York as well as several well known Italian restaurants in New York City such as Bocca and Putenesca. Finally Harvey represents many individuals in employment discrimination and related litigation. 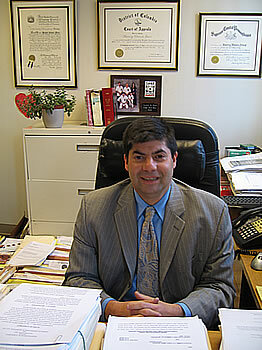 Harvey S. Mars has been a member in good standing of the New York State Bar for over thirty years. * He is also a member of the Pennsylvania Bar, the New Jersey Bar and the District of Columbia Bar. He is admitted to practice law before all Courts in New York State and New Jersey, The United States District Courts for the Southern, Eastern, Northern and Western Districts of New York, The United States District Court for the District of Columbia, the United States District Court for the District of New Jersey ,the United States Court of Appeals for the Second, Third and District of Columbia Circuits and the United States Supreme Court.